The National Championships of the International Moth Class will take place in the George in Dun Laoghaire this year form 5-7 October. Irish Ferries have offered us a special deal for anyone travelling over from the UK via Holyhead: Car/van & trailer return trip incl 2 passengers - £250…. Call Irish Ferries UK office on 01512 421 608, Ask for Mark and tell him you are going over for the Irish Moth Nationals in Dublin. 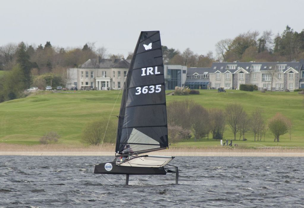 Former Olympian Rory Fitzpatrick, now coach to sailing star Annalise Murphy, has proved to his protégé that experience can triumph over youth…at least when it comes to Moth sailing. 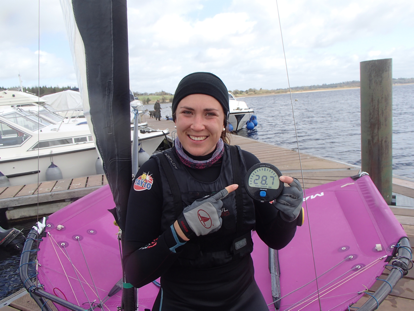 After an intense two day battle on the waters of Dublin Bay this weekend, Fitzpatrick beat off stiff competition which included Annalise Murphy to reign supreme at the DinghyKit.com Moth National Championship. Many of the world’s top sailors now compete in Moths as these boats offer some of the most challenging sailing in the world whilst allowing them to further hone their skills. Blistering sunshine and light winds greeted the country’s top Moth sailors on Saturday (21 June) for the first day of the DinghyKit.com Moth National Championship in the National Yacht Club. The light conditions proved challenging for the fleet of high speed boats so tactics and strategy were crucial. Reaching speeds of between 15 and 32 mph, the light-weight Moths almost fly across the water’s surface but achieving such speeds also means that when they capsize it’s spectacular. Buoyed on by the spectators on Dun Laoghaire’s East Pier, renowned Moth sailor John Chambers was first to take the lead. Fitzpatrick fought back in Race 2, taking the win and tying himself and rival Chambers on equal points at the top of the leader board. Sunday (22 June) brought with it a fresh breeze and an exciting three-race spectacle. Earning his second win of the regatta, Fitzpatrick was in pole position after Race 3 just one point ahead of Chambers. After many positional changes and tight racing between the leading group, Annalise Murphy was the ultimate winner in Race 4. But this wasn’t enough to see her climb to a podium position. Now two points clear, Fitzpatrick had the championship title within grasp. In a display of skill seen only at this elite level, Rory Fitzpatrick earned his hatrick win in Race 5 to claim the title of 2014 Dinghykit.com Moth National Champion. Annalise Murphy had to settle for fourth place while John Chambers took Silver and Alistair Kissane went home with the Bronze. 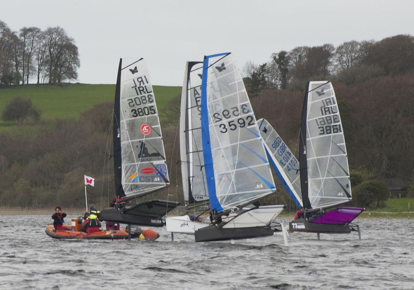 Having only formed in 2013, the Irish Moth Tour has gone from strength to strength in recent months. The bug is biting and new sailors are continuing to join the fleet. A major boost for the Tour has been the announcement of title sponsor DinghyKit.com a one-stop-shop providing all the best dinghy systems and information online. 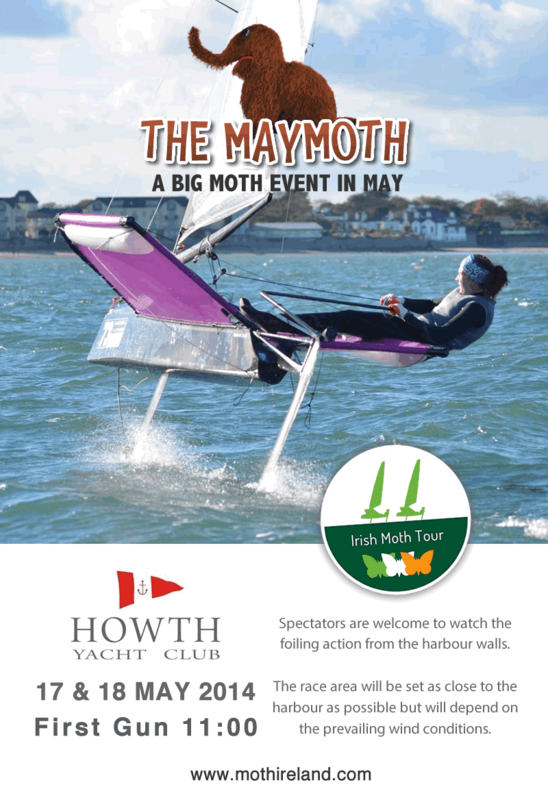 DinghyKit.com is proud to support the Irish Moth Tour and what is one of the fastest growing classes in Ireland. 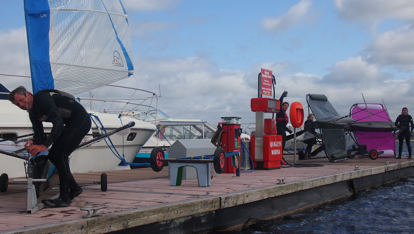 The Irish Moth fleet planned a weekend away in Lough Ree for our third ever event! Ronan Wallace (moth newbie) and myself (Annalise) arrived down to Quigley’s Marina in Killinure early on Friday afternoon which gave us time to set up our boats before easily launching off the pontoon (staying nice and dry!) and heading out into the main lake for a great sail up and down to Hudson Bay 2 or 3 times! By the time we got in Ryan Seaton had arrived guided by his tomtom on the scenic route from Belfast to Athlone and John Chambers arrived not to soon after! Both told stories of passers by asking what kind of airplane was on the roof of their cars! We all headed to Glasson Golf Club for dinner before going back to the Killinure Chalets where we had taken up residence in the 17 man house! 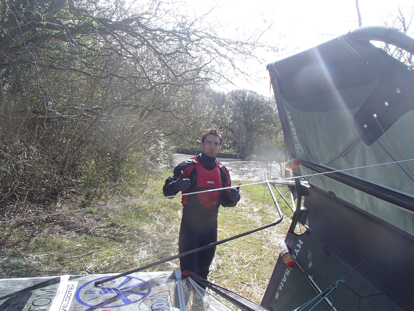 The next morning we all got rigged and changed, then had a short briefing where Con told us the plan for the day! The idea was to do 3 races off the marina before racing downwind to The Wineport Lodge for lunch, followed by another 3 races in front of the Wineport then a race home! After one rather traumatic race where nearly everyone manage to crash into each other or the rushes at some point we headed off downwind to the Wineport which turned out to be a real adventure sailing through small cuts and around islands! Once we arrived down to the area in front of the Wineport, we did another 2 races, Rory was in good form so far winning 3 out of 3! We then headed in to the Wineport Lodge for lunch. 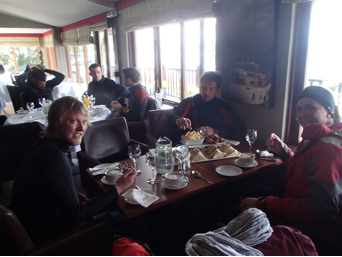 We were treated like kings, and had an amazing selection of soup, sandwiches, chicken wings and chips all while in our wetsuits! After possibly a sandwich or five too many we headed back out on the water, Ryan and I now regretted our decision to park our boats in the forest as getting out through the thick reeds proved to be extremely difficult, after 15 minutes of swimming while towing my boat in the extremely chilly Lough Ree water I was back on the race course, Ryan however ended up abandoning this tactic and carried his boat around to the jetty at the Wineport! Back for more racing and it had got a bit more patchy so looking for wind was what proved to be important (and not capsizing). In race 4 Rory crashed out meters from the finish line and watched Ryan, myself and John all speed by him. Race 5 was Ryan’s race finishing close to a leg ahead of the rest of us! Race 6 was a quick upwind to the windward mark then a fast reach across to the cut then a 20 tack upwind back to Quigley’s Marina. Rory, Ryan and I all managed to get through the cut in the rushes foiling and we then met up with Gavin who had chosen the more sensible route home! It was then a battle of fitness and boat handling all the way back to the marina. John and Ronan unfortunately hit a lull as they raced through the cut and spent quite a bit of time stuck in the rushes. After an exhausting day 1, moth newbie Neil O’Toole had a quick blast in John’s boat before we all headed to the Killinure Chalets Pub for dinner. A mix of T-bone steaks and giant crispy ducks came out so we were all very well fed at the end of a long day! Sunday started off looking like a nice medium day but by the time we were launching it was up to 20knots gusting 25 sometimes, so Con made the call to race us just of Quigley’s marina again! All 7 of us got out on the water after Gavin fixed his main foil and Neil got his boat sorted too. In some of the gusts downwind we were hitting 25-28 knots and trying to turn up at that speed is extremely difficult but luckily we had a good incentive to get the turn ups right as if we didn’t we would crash into the reeds at the side of the lake! Race 7, race 8 and race 9 were won by Rory with Ryan and John taking second in one each. Ronan and me were busy trying to get around the leeward mark in both these races! In the last race of the day Rory and I were neck and neck all the way around and after an out of control round up I managed to get just ahead of him to win by a boat length! Rory retained the teapot trophy, with Ryan in second, John and Annalise finished on equal points and then Ronan, Gavin and Neil. We all had a great weekend and would like to thank Quigley’s marina for letting us launch from there, The Killinure Chalets for the great house, The Wineport Lodge for the amazing lunch and letting us sit inside their restaurant in our wetsuits! The Wag class for showing us they are definitely the class who has the most craic! But particularily to Con for being OOD and Eddie and Dara for helping out on the committee boat! Clara for the photos and not getting irate over the amount of carbon chat that happened at the weekend, and last but not least Cathy for organizing everything! It really was a brilliant weekend! 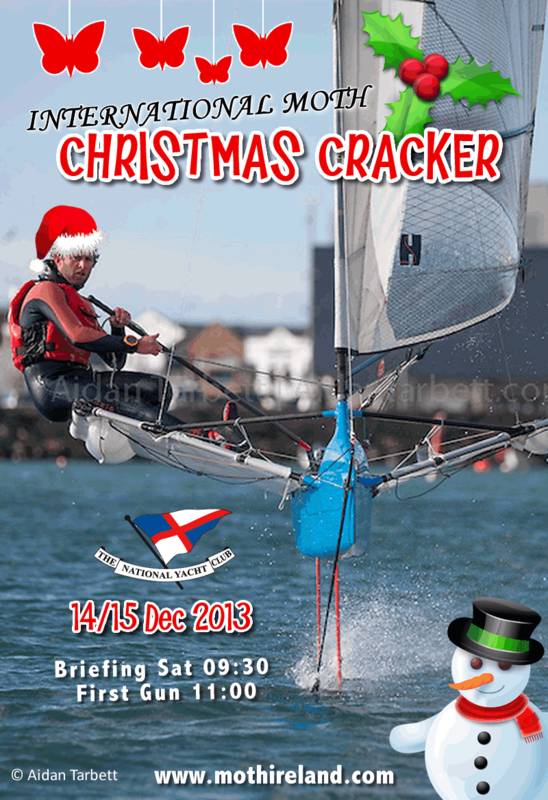 The 2nd installment of the Irish Moth Tour is this Saturday and Sunday 14/15 December 2013 in the National Yacht Club, Dun Laoghaire. First Gun is scheduled for 11am on Saturday but the forecast is looking windy. Could be an ideal chance to get in a dash for cash or speed trial in the flat waters within the Harbour walls. It's a Christmas themed event so bring your Geansaí Nollaig (Christmas Jumper) and Santa hats. Here's the latest run down on the Christmas Cracker entries. 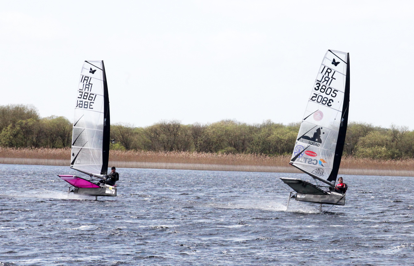 Alistair Kissane; nearly ran away with a race in Howth in his Ninja with Mach 2 foils. An msl 10 has renewed his form. Loves to calculate and a methodical thinker on his boat set up. When converted to speed he's a proven danger and be happy to upset the form guide. Stephen Oram; a fireball champion and experienced hand. Another from the engineering clique where you his boat gadgetry is always a step ahead. An enigmatic foiler so hard to gauge the local flyer will be looking to transfer his fireball form to the Moth this weekend and blaze a trail around the bay. Rory Fitzpatrick; went into the Howth leg as odds on favourite but failed to convert. Summer form seems to have waned but mumblings are that he's looking to square things up. 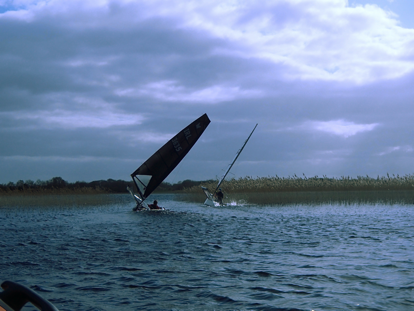 Riding on a Mach 2 with chopped down foils he'll have a score to settle on local waters. Con Murphy ( Race Officer ); respected as one of the best by the coaches and sailors after the Laser Europeans in Dun Laoghaire this summer. Some say flying boats are new ground but he's been on the water with them before and knows the score. A sure thing to deliver good racing on the day. Olivier Prouveur ( Race management ); often pulls in the big shows in our sport to Dun Laoghaire. A big driver on the Irish Moth scene with the creativity to make new things happen. The Irish Mothies will feel at home on his deck.